Over 83% of your potential clients will visit your website at least once before making the decision to do business with you. 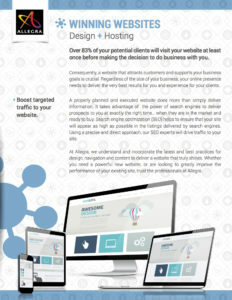 Consequently, a website that attracts customers and supports your business goals is crucial. Regardless of the size of your business, your online presence needs to deliver the very best results for you and experience for your clients. A properly planned and executed website does more than simply deliver information. It takes advantage of the power of search engines to deliver prospects to you at exactly the right time… when they are in the market and ready to buy. Search engine optimization (SEO) helps to ensure that your site will appear as high as possible in the listings delivered by search engines. Using a precise and direct approach, our SEO experts will drive traffic to your site. At Allegra, we understand and incorporate the latest and best practices for design, navigation and content to deliver a website that truly shines. Whether you need a powerful new website, or are looking to greatly improve the performance of your existing site, trust the professionals at Allegra.